Photo courtesy of PricewaterhouseCoopers Public Sector. PricewaterhouseCoopers Public Sector (PwC PS) was formed in 2005 and is one of 17 business units of PwC. Key customers are the U.S. federal government and state and local governments. Within PwC, this group is the only unit to serve this market. PwC PS provides business advisory services, including risk consulting, management consulting and technology consulting. Headquartered in McLean, Va., PwC PS employs nearly 1,100 people and reported a gross revenue of $265.5 million for fiscal year 2014. PwC PS was one of the fastest growing consulting firms serving the federal government for the period 2011-2014. Thanks to its Engagement Management Process (EMP), scores rating PwC PS as “exceptional” or “very good” increased from 50 percent in fiscal year 2008 to levels at or near 100 percent for fiscal years 2010 through 2014. Additionally, the percentage of responders that said PwC PS “needs improvement” decreased from 73 percent in fiscal year 2011 to zero in fiscal year 2014. Strategic planning has helped PwC PS address the challenges of decreased federal funding for contractor services and increased pressure for lower rates by competitors. Revenue results have exhibited continuous growth, from $41 million in fiscal year 2005 to $265 million in fiscal year 2014. The total number of staff certifications has steadily increased 424 percent from fiscal year 2008 to fiscal year 2014. Certifications correlate directly with PwC PS’s increasing revenue trends. PwC PS utilizes scores from the federal government's Contractor Performance Assessment Reports to improve customer satisfaction. Thanks to its Engagement Management Process (EMP), scores rating PwC PS as "exceptional" or "very good" increased from 50 percent in fiscal year 2008 to levels at or near 100 percent for fiscal years 2010 through 2014. Additionally, the percentage of responders that said PwC PS "needs improvement" decreased from 73 percent in fiscal year 2011 to zero in fiscal year 2014. Net Promoter System (NPS, a tool for measuring and comparing customer engagement and loyalty) survey scores have been 50 or higher in all markets since fiscal year 2012. These scores are equal to or better than NPS scores for some of the most respected companies in the country. PwC PS uses its formal Pursuit process to systematically capture business and engage customers. Pursuit integrates methods by which staff can better listen to potential, current and former customers at various points in each relationship. Additionally, Pursuit is integrated with the EMP to provide support and strengthen communication. Pursuit has helped increase active contracts from 290 to 1,050 over the past seven years and achieve a contract "win rate" for the practice that has been 11 percent better than a key competitor for the period fiscal year 2012 to fiscal year 2014. Knowledge management is the process of capturing, developing, sharing and effectively using organizational knowledge. PwC PS collects content through its Knowledge Gateway where it is reviewed by PwC PS's knowledge management team and competency leaders. It is then shared and transferred through an innovative web-based tool designed to help professionals across the PwC network collaborate with one another. PwC PS uses this internal collaboration system to find and share professional knowledge, exchange ideas, create insights and seek developmental opportunities. The tool received a 2014 Gold Intranet Innovation Award from Step Two Designs, a global firm that annually recognizes intranet-related new ideas and approaches. PwC PS utilizes a fully deployed process to embed learning throughout the organization. The practice's Knowledge Gateway supports self-service learning and contains over 100,000 documents to support knowledge transfer. PwC PS senior leaders identify high-performing units/operations and then invite them to present their leading practices at partner/managing director meetings. Leading practices also are deployed through internal systems such as the Knowledge Gateway and the annual Solutions Expo, a forum for staff to share and showcase innovative solutions, tools, marketing strategies and processes. Over 600 practitioners attended the fiscal year 2014 Solutions Expo, which featured more than 60 innovations and led to over $6.7 million in government contracts from related procurement opportunities. Outcome measures for work and support processes are defined and regularly reviewed. For example, contract closeout completions verifying that obligations have been met and resultant payments are accurate increased more than fourfold from 2012 to 2014. Demand management—making internal resources available prior to hiring and onboarding—has reduced onboarding costs by an estimated $2 million since 2012. PwC PS senior leaders monitor key metrics to control overall costs and work with their operations leaders and the practice's Quality Management Group to make decisions. Team members continuously assess quality to prevent defects, service errors and rework before dealing with clients. An extensive, well-deployed business continuity plan is used to prepare PwC PS for emergencies and disasters. Multiple drills are conducted in each office, with exercises including both physical and hypothetical (with modeling of expected results) scenarios. Information on the drills and recovery scenarios is made available through the Knowledge Gateway. PwC PS has a systematic, four-step approach (observe, orient, decide, act) to strategic planning. Short- and long-term plans are developed and streamlined to enhance organizational agility. PwC PS has four strategic goals focused on profit, workforce, customers and operations. These goals are aligned to strategic objectives, strategic advantages, strategic challenges, short- and long-term plans and performance projections/targets. Goals are developed with changes to services, clients and markets considered. Strategic planning has helped the practice address the challenges of decreased federal funding for contractor services and increased pressure for lower rates by competitors. Revenue results have exhibited continuous growth, from $41 million in fiscal year 2005 to $265 million in fiscal year 2014. PwC PS aligns its workforce into a framework that delivers value to clients while encouraging individual staff career and leadership development. A matrix structure allows staff to be aligned both vertically along sectors and horizontally based on competencies. 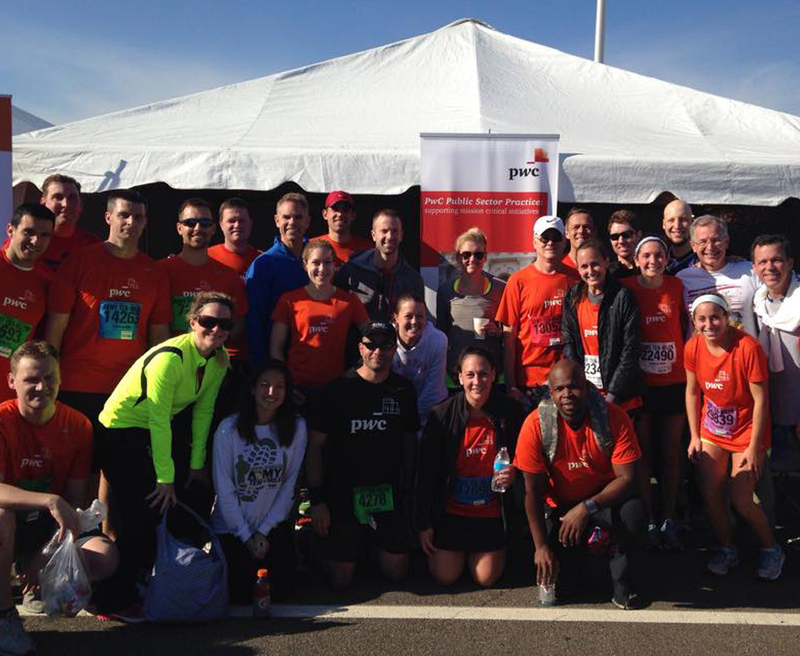 In 80 percent of client engagements, PwC PS teams with an external entity. For example, its Mentor-Protégé Program provides business exposure and opportunities for a limited number of small, veteran-owned, business-teaming entities. Each relationship requires a specific scope tailored for the protégé, a formal application and approval. Workforce policies, services and benefits are reviewed annually to help ensure that they continue to meet changing workforce needs. The Knowledge Gateway offers easy access to information on health, financial, work-life balance and professional developmental options. The total number of staff certifications has steadily increased 424 percent from fiscal year 2008 to fiscal year 2014. Certifications—which correlate directly with PwC PS's increasing revenue trends—have been earned in quality management, project management, information systems, information technology, certified public accounting and certified government financial management. Workforce turnover has decreased each year since fiscal year 2009, from approximately 22 percent to 13 percent—a rate that is considerably better than the industry average of 20 percent.